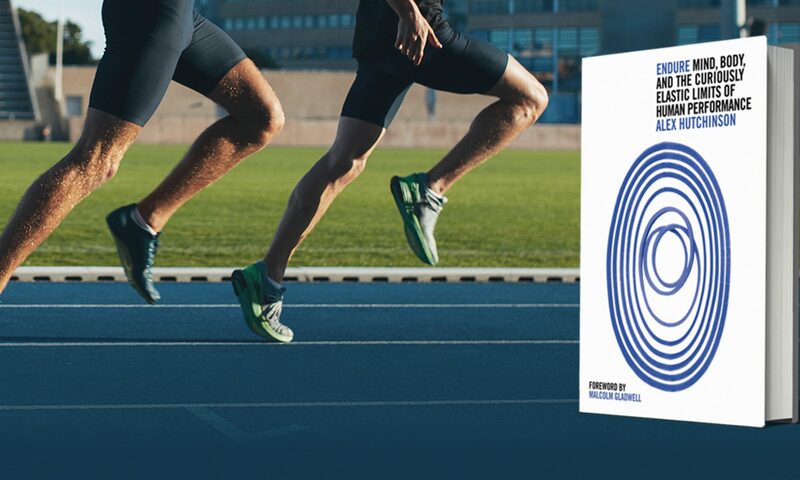 The performance-boosting effect of beet juice, attributed to the nitrate it contains, has been one of the biggest sports science stories of the past year. A few days ago, Swedish researchers published a new study in the journal Cell Metabolism (press releases here and here) that answers some questions about how nitrate works — and raises some questions about whether mouthwash might actually hurt your performance. Interestingly, this Swedish group has been publishing results on the performance-boosting effects of nitrate since 2007. It’s only when Andrew Jones’s group at the University of Exeter started publishing results in 2009 using beets instead of isolated nitrate that everyone started paying attention. The study: a randomized, double-blind crossover trial with 14 subjects given either 0.1 mmol/kg of sodium nitrate or a placebo each day for three days. Since their previous studies have shown that this protocol allows subjects to use less oxygen while cycling at a given intensity, this time they looked for the root cause. They isolated mitochondria (the cellular “power plants” that generate ATP to fuel muscle contractions) in the subjects. Sure enough, the mitochondria from the nitrate group used less oxygen to generate a given amount of ATP. Further (rather complicated) experiments suggested that this is because nitrate leads to lower levels of a protein that causes efficiency-sapping proton leakage across the mitochondrial membrane. So what does it mean? Well, the researchers suggest that it might be nitrate (which, as they note, “has previously been considered merely as an inert end product of NO metabolism or as a potentially toxic constituent in our diet” — think hot dogs) that is responsible for the well-known but poorly understood health benefits of a diet high in vegetables (particularly leafy green ones). And of course, it’s more evidence that nitrate might be the real deal as an ergogenic aid for endurance athletes. Circulating nitrate, normally derived both from endogenous NO [nitric oxide] production and from dietary intake, is actively taken up by the salivary glands, excreted in saliva, and reduced to nitrite by commensal bacteria in the oral cavity. Even though nitrate levels in saliva were similar, the bacteria needed to convert nitrate to nitrite was gone in the mouthwash experiments, so nitrite levels in saliva remained flat. 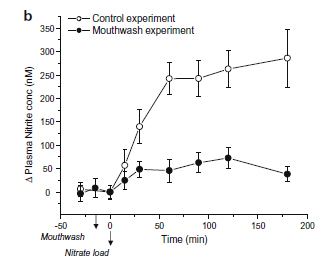 As a result, nitrite levels circulating in the blood (which is what’s shown above) increased far less in the mouthwash than the non-mouthwash case. Unfortunately, this still doesn’t tell us much about timing and chronic effects. If you mouthwash before bed, will your nitrate-to-nitrite conversion still be impaired at dinner the next day? I really don’t know. I’m certainly going to keep mouthwashing — but it might make me think twice about the gratuitous middle-of-the-day extra gargle! Interesting indeed but gum disease isn’t good for you heart either so I’m sticking with my nightly brush, floss and Listerine routine for now. The point about mouthwash (or really, about oral bacteria) is interesting given stories I’ve heard about Yifter coaching guys at York: he wouldn’t let them drink water or spit during intervals. I wonder if he was up on this research or if it was some kind of intuitive thing? Yes, I’d like more details on the timing of ingestion as it relates to performance. That way we may understand if we can use mouthwash at a specific time-delay/advance that would allow both improved mitochondrial function and a great smile. John, having been coached by Yifter at a junior triathlon camp back in the day, his no spitting policy was about respecting where you train. The no drinking was a way of toughening you up! Intuitive perhaps, but just as likely what he was taught as a wee lad on his way to winning World and Olympic medals, so I’ll go with experience. Interesting stuff, guys. I’ve added a few more details from a mouthwash-and-nitrates study above. As for Yifter’s advice, that’s pretty cool — I’ve definitely gotten into lots of arguments with training mates about horking on the track and infield (especially indoors!). As I point out, 10 minutes after the workout, we’re going to be lying around stretching in precisely the place where you’re hocking up a loogie. It’s gross! As for the not drinking part, that reminds me of a friend of my dad’s who I met in middle school. He’d twice qualified to represent Ghana over 800m in the Olympics (though he didn’t get to go, once because of a boycott and once because of a drought/famine in his village). His advice to me as an aspiring runner was to practice holding my breath in bed every night before I went to sleep. Even at the time, I was skeptical of the science behind the advice, but I viewed it more as a path to self-confidence and belief in my own toughness. In other words, sometimes it’s not so much about the details of the ritual — it’s the fact of having a ritual that makes the difference. So I’d lie in bed and hold my breath. Pingback: Sweat Science » Aske Jeukendrup on beets, hydration, train low, etc. Previous PostPrevious Can sitting too long really hurt your health? Next PostNext How much compression do socks need?